Me: This is my favorite birthday song, back from when I was a little older than you. Emily: Wow, Mom. You were alive then? You are OLD! Emily: Did people really dance like that? What does she have in her hair? Me: A giant bow. Yep, I wore that too, and I tried to dance like her. 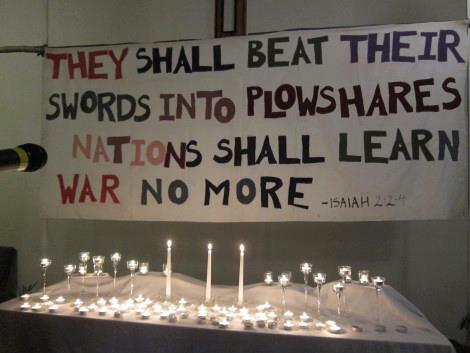 The Profligate Grace team is delighted to bring you this report from our London correspondent, Angela, and her friends in the Christian Campaign for Nuclear Disarmament and Christianity Uncut. Read on for an improbable (but true) account of their act of witness outside the recent Leadership Conference sponsored by a very, very prominent evangelical Anglican parish. While making cupcakes and washing dishes, I have listened to my little kitchen radio chase down stories like this (on the factory collapse in Bangladesh), and, today, more of the same – this time from Cambodia. We’re proud to host this report by Patrick O’Neill, whose writing appears in the National Catholic Reporter, the Independent Weekly, and the Raleigh News and Observer, among other places. Patrick and his wife, Mary Rider, are co-founders of Garner’s Fr. Charlie Mulholland Catholic Worker House, an intentional Christian community that provides hospitality for men, women and children in crisis. They have 8 children.